The Transregional Center for Democratic Studies (TCDS) builds on international and interdisciplinary traditions that The New School for Social Research (NSSR) inherited from the University in Exile, which was established at The New School in 1933. 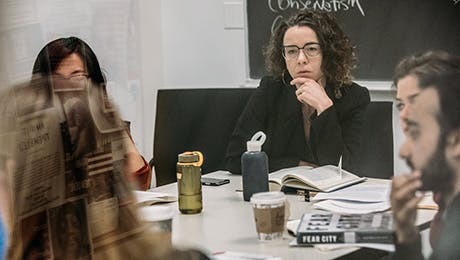 TCDS was founded in 1990, inspired by the peaceful dismantling of communism in Eastern Europe, and has been directed from the start by Elzbieta Matynia, associate professor of Sociology at The New School for Social Research. The center offers unique opportunities for global advanced research and cross-cultural collaboration. Its projects address democratic transitions, the workings of collective memory, and—increasingly important in times of massive migrations—the development of a "culture of borderlands" and an "ethos of border thinking" in order to promote a general openness to difference, hybridity, and diversity in civil society and civic life. TCDS's integrated program activities draws on the concept of the "region" as a promising perspective from which to examine the complex relations between the local and the global, not only for policy makers, but also for nongovernmental organizations and a new breed of practice-oriented scholars in the social sciences and humanities. While yielding more comprehensive, in-depth explanations of processes taking place in today's world, the transregional approach encourages and facilitates the quest for consensus among peoples separated by divergent histories, cultures, and economies. An core belief at TCDS is that adequate social and human capital is an essential element in forming and consolidating democratic governance. One proven cost-effective and valid method of cultivating this capital is to invest in the academic and professional development of, and collaboration with, civic-minded graduate students and junior faculty members at universities here and abroad. TCDS's programs, always open to the broad interests of our students and faculty and inspired by world events, have been engaged primarily with five regions: Central and Eastern Europe; Central Asia and the Caucasus; Sub-Saharan Africa; Latin America; and North America.